I have to admit. I love kitchen gadgets, tools and space saving features that make my work in the kitchen easier, more productive and enjoyable. Some are what I call “kitchen fluff.” but others have become must have kitchen features for me. Whether you are looking for more counter top space-, better cabinet functionality, or the latest in kitchen tools and gadgets, these kitchen features might become must haves for you too. These ideas go a long way to organizing a kitchen to make it more functional. Many are space saving ideas and all make life easier. I have several sizes of fry pans. Storing them so that they are easy to get to just got easier! 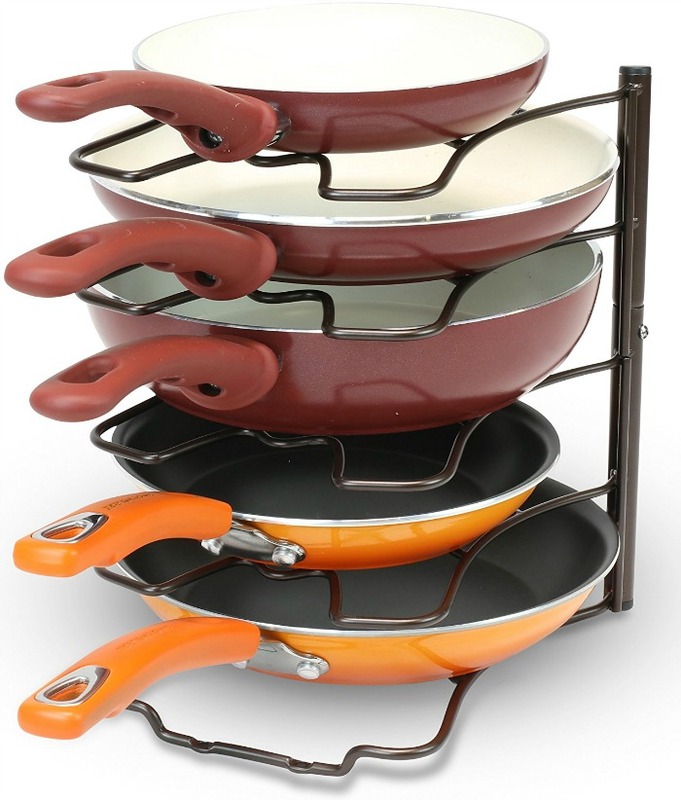 This pan organizer rack can be used either horizontally, as shown, or vertically in a cupboard to separate the pans for easy access. I have lots of room in my lower cabinets but it is hard to get to the back areas of them. Rev a Shelf makes many cabinet organizers to solve this problem. This two tier roll out shelving unit is secured on bottom, side and rear mounts for total stability. Just slide it out to bring the items at the back of the cabinet into view. Slide out Pantry Spice Cabinet. 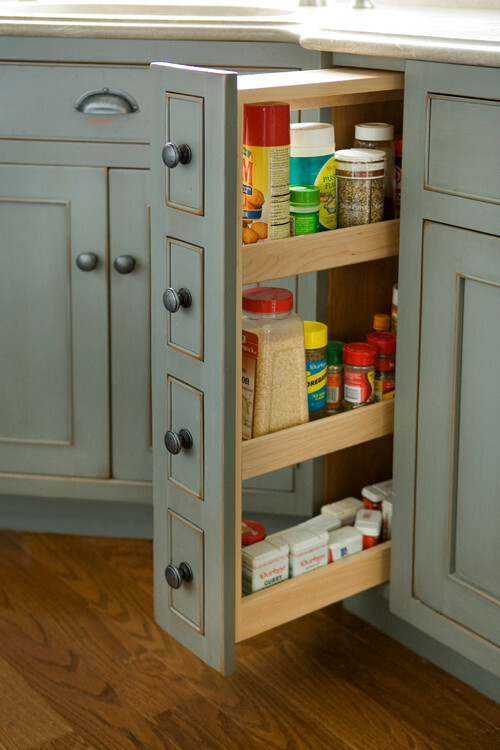 A slide out cabinet is the perfect size for holding narrow jars, spices and other cooking items that can get lost in a pantry. This slide out mini kitchen pantry from Heartwood Kitchens is a great way use of a small space and keeps those items you use all the time at hand’s reach. Source: Houzz. I don’t know about you, but I spend a lot of time chopping veggies and then transferring the scraps to the garbage. This idea changes that task. When Thanksgiving rolls around, my oven space holds a whole turkey and the racks have to be raised, (or removed) to hold it. This idea makes better use of the oven space. 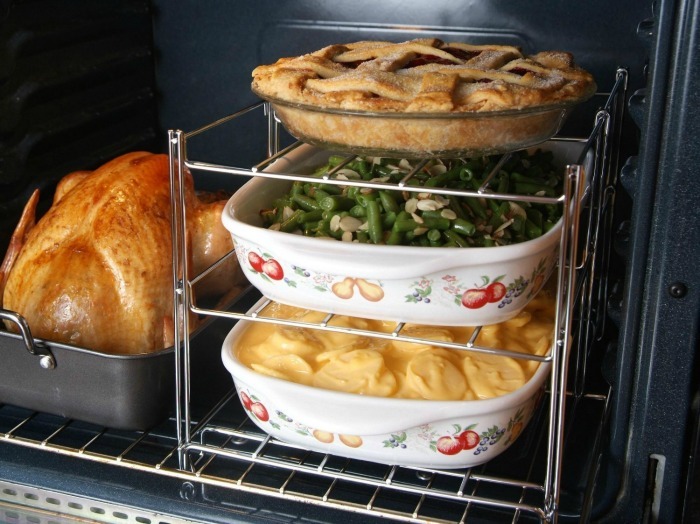 This multi tier collapsible oven racks gives extra shelf space next to the turkey for casseroles and fold away for storage when you are not using them.. You can see it on Amazon. The walls of many kitchens are a fabulous space for extra storage. It can be both functional and attractive, too. 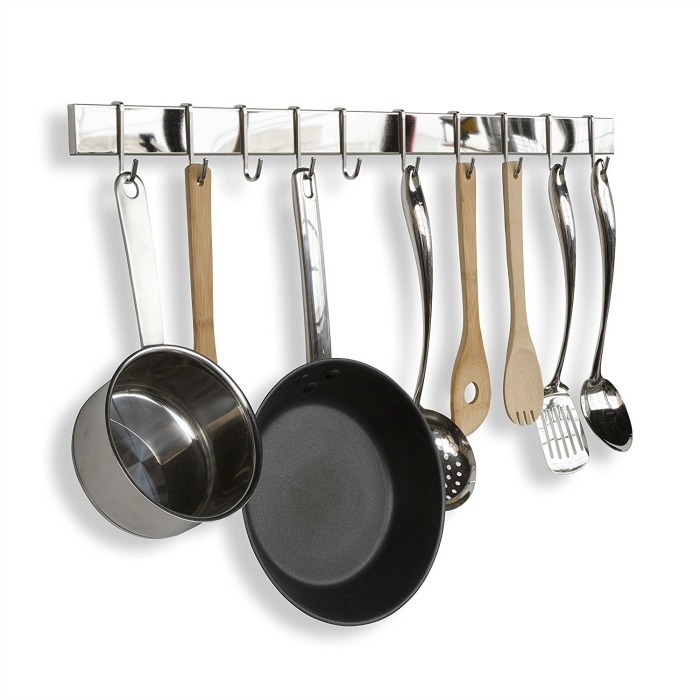 This polished chrome wall rack holds kitchen utensil or sauce pans on unused wall space in a very decorative way. The corners in the kitchen are very wasted spaces. Whether this happens on the counter top, or in the cabinet underneath the counter, the area is often hard to get to and under used. 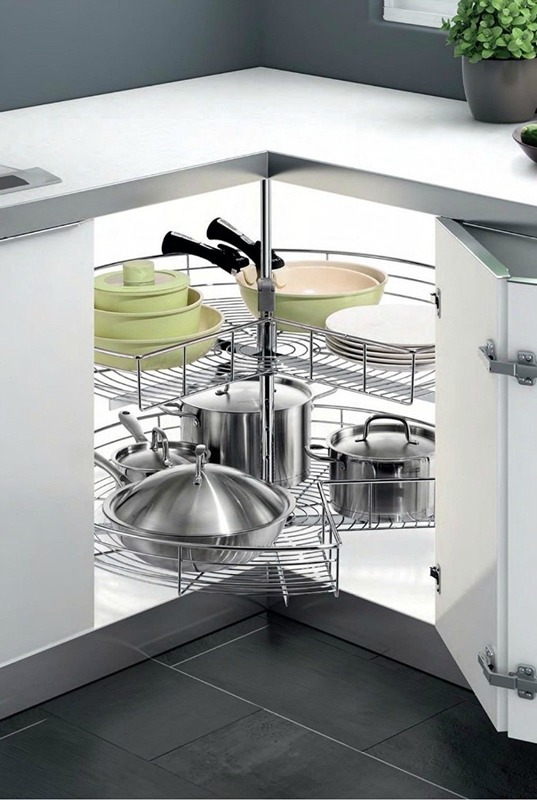 For corner cabinets, a well designed lazy Susan setup is ideal. It allows you to access the items in the cabinet by just turning the storage drawers. A hinged door is a must have to go along with the set up. Cutting boards can take up valuable counter space, especially in small kitchens. 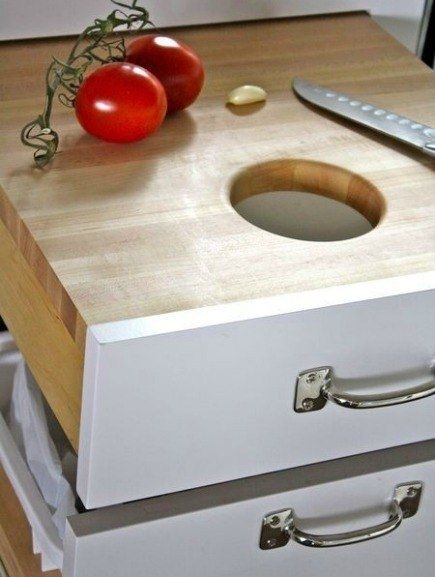 This slide out cutting board is the answer. 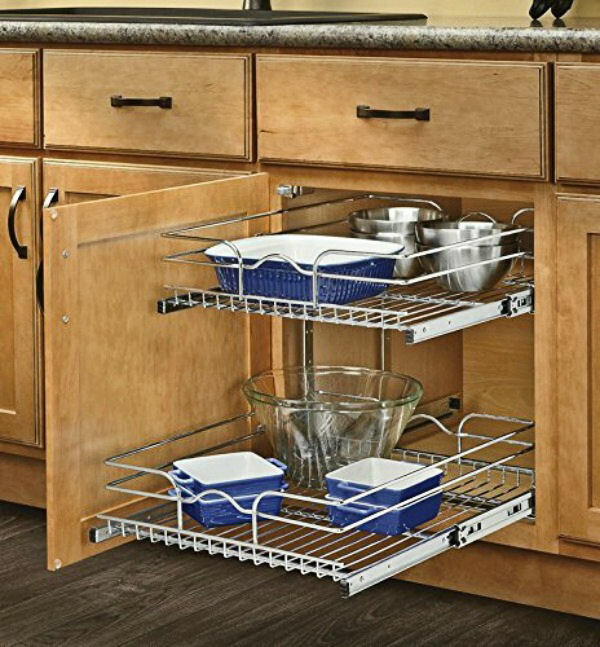 This easy to install, heavy duty steel rail system uses adjustable brackets to fit neatly inside most base cabinets. 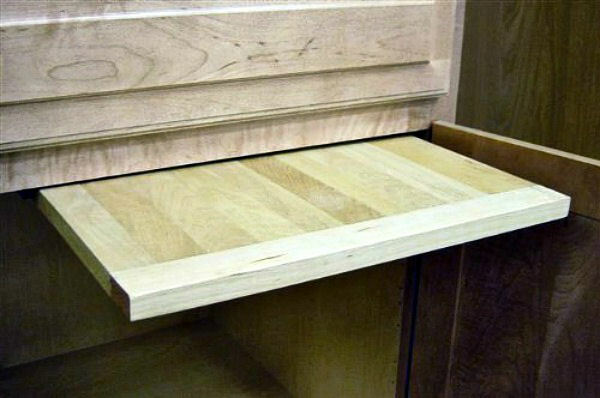 It uses the unused space at the top of a base cabinet to store a hardwood cutting board and stores it neatly out of sight until you need it. What are your must have kitchen features? I’d love to hear about them in the comments below. Admin Note: This post first appeared on the blog in December of 2013. I have updated it to add even more must have kitchen features. Enjoy!